Top Spin offers an intimate look into the lives of two teenaged table tennis titans who have sights set on the 2012 London Olympics. 178 backers pledged $26,100 to help bring this project to life. Out of the basement and into the spotlight, this is ping pong like you’ve never seen it! UPDATE: NEW GOAL OF $25K! In one word: WOW. With the help of incredible supporters consisting of table tennis fans, filmmakers, friends, family, and generous strangers – we have already reached our goal! Some of you have even been asking if we can exceed our target and the answer is YES! We can raise as much money as is possible before our July 20 deadline. In fact, we’d love to skyrocket pass the $20,000 mark, which is why we've set a new goal of $25,000 since this is just the beginning. Anything beyond $20K would help us move forward with our project sooner. Our next shoot after China is a shoot with Michael in New York. To give you a little more info about our process, the money raised here is only a fraction of our overall budget. But it’s extremely challenging to raise the money all at once through Kickstarter, which is why we’re also ferociously applying to various grants. HOWEVER, a hugely successful campaign will give us momentum and show funders that people want a film like TOP SPIN to be made!!! A huge THANK YOU to everyone out there who’s been so supportive! Honestly, we can’t say those two words enough. We have been overwhelmed by the response and have to pinch ourselves every day that this is really happening. As we approach our final push, please join us in continuing to spread the table tennis love! Imagine the smell of fresh rubber rackets, hollow plastic balls whirling by at 80 mph, sweat-drenched limbs, and exclamations of triumphant victory interrupted by bitter cries of defeat. Welcome to the world of competitive table tennis. TOP SPIN introduces audiences to ping pong phenoms who are finally giving serious table tennis fans in the U.S. something to cheer about. In 2009, Michael Landers was crowned the youngest ever U.S. Men’s Singles Champion at the ripe old age of 15. History repeated itself in 2010 when Ariel Hsing became the country’s youngest ever Women’s Singles Champion also at 15 years of age. Now the two teenagers have their eyes set on the Olympic Games with lofty goals of winning a medal, a feat the U.S. has yet to accomplish in the sport. The film follows Ariel and Michael for a year as they compete domestically and internationally to qualify for the Olympics, all while juggling their last years of high school. Amidst the rigorous training and strict tournament schedule, SATs and college applications loom largely over their heads with the ultimate question arising: with no professional table tennis outlet in the U.S., what does the future hold for them? We are currently in the early phases of fundraising and production. The money raised from this Kickstarter campaign will go towards our two upcoming summer shoots. This July marks the 40th anniversary of Ping Pong Diplomacy between the U.S. and China, and several events have been organized in the Bay Area to commemorate the occasion. We will film Ariel playing against her idol, Zhang Yining, on July 6. This summer, Michael will train in China where many of world's best table tennis players hail from. We look forward to filming with Michael and seeing firsthand the immense popularity of the sport in the table tennis capital of the world! These two shoots are only the beginning. We’ll be following Ariel and Michael for the next year until the 2012 Summer Olympics in London. It’ll be a challenge keeping up with these two, but we can do it with YOUR SUPPORT! THE PUSH: $100 (Option 2). 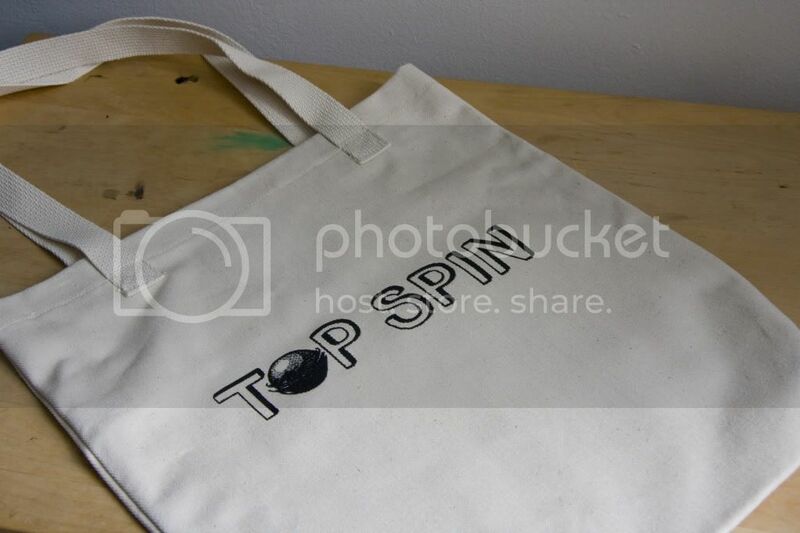 A limited edition TOP SPIN canvas tote bag hand-printed by fellow filmmaker, Ryan Malloy (see photo below). These are now SOLD OUT! We only have 30 days to reach our goal! Donate early and help spread the word to all your friends. Every dollar donated puts us one notch closer to hitting our goal. The unique thing about Kickstarter is that we must reach our goal or else we don't receive any funds! $50 X 400 FANS = THE FUNDING GOAL! We've caught ping pong fever and we know you will too! Thank you in advance for your donations and support. PLEASE HELP SPREAD THE WORD! Stay connected by becoming a fan on Facebook and following us on Twitter! **Feel free to reach out to us at topspinmovie@gmail.com! THE LOOP: A special shout out on TOP SPIN’s Facebook or Twitter page and our eternal gratitude. Just like the LOOP is considered by many the most important shot in the game, $1-10 donations are just as effective and appreciated! THE BACKSPIN: A limited edition illustrated postcard of Ariel and Michael, a special shout out on TOP SPIN’s Facebook or Twitter page, and our eternal gratitude. THE TOPSPIN: All of the above AND a digital download of our award-winning short film, Top Spin (2010). THE SMASH: All of the above AND a JOOLA ping pong ball autographed by either Ariel or Michael. Ariel is a JOOLA USA sponsored athlete and JOOLA USA has generously donated several rewards to help our film. THE LOB (OPTION 1): A JOOLA t-shirt, a DVD of the finished film, AND a thank you in the credits of the film. *JOOLA t-shirt limited to the first 20 backers. THE PUSH (OPTION 2): A limited edition TOP SPIN canvas tote bag, a DVD of the finished film, AND a thank you in the credits of the film. *Limited edition TOP SPIN bag limited to the first 20 backers. THE BLOCK: A JOOLA racket set, a limited edition illustration of Ariel and Michael, a DVD of the finished film, AND a thank you in the credits of the film. *JOOLA racket set limited to the first 40 backers. THE SMOTHER KILL: A JOOLA iPong robot, a limited edition illustration of Ariel and Michael, a DVD of the finished film, AND a thank you in the credits of the film. *JOOLA iPong Robot limited to the first 10 backers. THE CHOP BLOCK: Associate Producer credit in the film, a pair of tickets to the film’s World Premiere, AND a DVD of the finished film. THE COUNTER DRIVE (OPTION 1): A 1-hour lesson with Ariel in San Jose, CA or a 1-hour lesson with Michael in New York City, Associate Producer credit in the film, a pair of tickets to the film’s World Premiere, AND a DVD of the finished film. *1-hour lessons limited to the first 2 backers. THE COUNTER SMASH (OPTION 2): A private screening and dinner with the filmmakers in either LA or NY, Associate Producer credit in the film, a pair of tickets to the film’s World Premiere, AND a DVD of the finished film. THE HIGH TOSS SERVE: A JOOLA ping pong table, Associate Producer credit in the film, a filmmaker pass to the film’s World Premiere, and a DVD of the finished film. *JOOLA ping pong table limited to the first backer. THE FINGER BREAKER: A trip to the 2012 London Olympics (airfare and 1 ticket to a table tennis event*), Executive Producer credit in the film, a filmmaker pass to the film’s World Premiere, and a DVD of the finished film. *This ticket is not guaranteed. However we will do our best to grant a comparable reward in its place, if unavailable.